It was a hot, humid, lazy kind of summer day….you know the kind when it is so dang hot you can fry an egg on a concrete sidewalk? Yeah, that hot! “Hot as blazes”, the old timers would say! But, I reckon since we were living on our farm in the hills of Southern West Virginia, there weren’t any handy sidewalks among those blasted hills and vales, so if we were hankering for a yummy egg we would have slung a double yolker on a large flat rock while we counted the seconds – one, two, three and zing it was a fried egg! Now, that was the power of a hot July day! There was certainly no shortage of places to cook an egg, as there were lots of rocks, but we had to forget about egg frying because we were out to pick some blackberries now ripening in the summer sun. Mama was anxious to make some of her delicious blackberry jam – not the syrupy kind that you bought in the stores, but the “real deal” homemade kind with big berries, and lots of them in every bite…ummmm! Mama had reminded us kids how much we liked to pile big dollops of it on her homemade biscuits she baked in the wood cook stove. 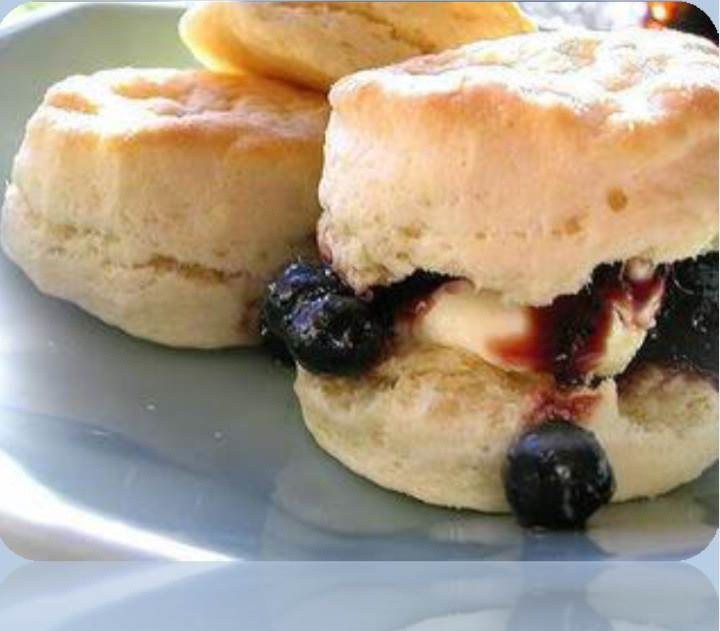 We would sure pile it on, let it ooze out the sides of the biscuits, and then let it drip out the sides of our mouth, usually right onto our clean, starched blouses, leaving evidence of a good blackberry biscuit eating time. But, then that’s what kids did – just made more work for Mama. The work seemed a little easier for Mama to reckon with since they were the kind of stains to make her right proud! After all, her blackberry jam would stand up to anybody else’s attempts at “jammin” in Monroe County! We didn’t have the money to go to the West Virginia State Fair back then, but if we had, and Mama had entered her blackberry heaven in the “Best Jam Contest”, she would surely have taken a blue ribbon! That’s just how good it was! Well, those thoughts were enough to get us moving, so we grabbed some big, tin pails to hold the prize berries that we were going to pick, put on some old berry picking clothes, making sure to dress in long pants since the briars on the berry bushes were prickly, and would leave big scratch marks on us if we didn’t have our legs covered. After we were fortified with the right gear, we headed off into the hills to find our summer treasure! Oh, that sun was scorching hot, but we kept thinking about those homemade biscuits with that delightful blackberry jam, and we started picking as many as we could gather in our eager, berry picking fingers. Our buckets were almost full, and we were eagerly working to finish our chore, so that we could proudly show Mama and Daddy the fruit of our day’s work. Then we could help wash and clean the berries so that Mama could start her divine healing and revelation of berry making chapters! I licked my lips just thinking about one of those yummy jam packed biscuits, and ignored the pungent taste of the sweat that had pooled on my face. After all, I thought, “Don’t they say that anything worth having only comes with hard work produced with ”blood, sweat and tears?” Well, Lordy, Lordy, I had the sweat, there was blood on my ankle where a blackberry limb had scraped me, and there would be tears if I did not return with my bucket brimming over with big berries. Such a dastardly thought was enough for me to pick even faster to get the buckets filled to past overflowing! So, I picked even faster, and the sun grew even hotter. It was then that I saw IT! I hollered so loud that every hillbilly in every shack must have heard me all the way to Pickaway, as my sister and brother came running to see what I was throwing such a dad blasted fit about. I screamed….”Look there on that rock. There is a humongous black snake that just crawled under my feet where I was standing. That’s why I hollered so loudly. How big do you think it is? Do you think it is more than 12 foot long? It’s gotta be…just look at it!” We all huddled together, not sure whether or not to run as fast as we could and leave our berry buckets there so we could run faster, or challenge the reptilian beast and continue picking! Oh my, decisions, decisions! That snake sure was big, and the sun sure was hot, but it was the blackberry jam, and the taste of Mama’s homemade biscuits that won out! Beast of snake, or no beast of snake, we were not going to abandon our prized berries, and the ultimate prize gained when we proudly gave them to Mama. Well, that was all many years ago, and I can still see that big,…… no, not just big,….. mammoth black snake there on that flat rock, sunning itself as if it didn’t have a care in the country world. But, it is the memory of the jam piled high on Mama’s biscuits that I remember best. I still eat blackberry jam, the syrupy kind that I buy in the store, and I eat biscuits, the kind that I buy frozen in the bag, and I eat biscuits with blackberry jam on them…….but they will never taste like the ones we had on a hot, July blackberry picking day! Part of the Second Creek Chronicles, a series about my days on our family farm in Monroe County, West Virginia.